Issue No. 1 of "The Journal of the Masonic Society" is arriving in Society members' mailboxes this week. This is a quarterly magazine containing Masonic information written by authors from all over the world. 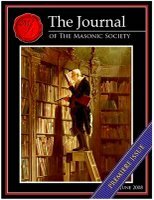 Speculative papers, news stories, fiction, poetry, great photography, insightful opinion and other editorial elements reviving the golden age of Masonic publishing. "The Ceremonies of St. John the Baptist and the Circle of Swords Contained Within the Entered Apprentice Degree" by James Hogg of Florida. "Initiation in the Ancient Accepted Scottish Rite" by Leon Zeldis of Israel. "The Story of the Lost Word and the Power of Myth" by John L. Cooper III of California. "Lodged in the Canon" by Quatuor Coronati Worshipful Master Brent Morris. "Ethiopia in Freemasonry" by Timothy Hogan of Colorado. A subscription to this magazine is only one of the benefits of membership in The Masonic Society. In addition, members are granted access to the Society's on-line forum, where hundreds of Masons from around the globe interact every day, helping each other advance in their Masonic knowledge. And of course it wouldn't be a Masonic organization without goodies like pins and membership cards, but the Society cranks up the quality of these items, producing elegant symbols of membership that are earning accolades. In addition, each member receives an 11x14 patent, personalized and highly stylized that you'll want professionally framed. It is a very impressive document, on parchment with a hand-stamped wax seal. conversation in the forum, there is no end to what a curious Mason can learn from his brethren in this organization. Since announcing our existence on May 1, our membership has grown to more than 400. Our President is MW Roger Van Gorden, Past Grand Master of Indiana. Our Editor-in-Chief is W. Bro. Chris "Freemasons for Dummies" Hodapp. And our Directors, Officers and Founders include many leaders in Masonic education, including authors, publishers, curators, lecturers and more.